I felt like making a camera-like effect. There's scanlines, they look alright here but they seem better in the link. That's pretty cool! How did you do that? I need an effect exactly like that for "probe" videos. matty406, if you want to reproduce a CRT display with artifacts you should make the scan-lines with variable brightness and thickness: the brighter the "pixel" of the image (a short piece of the scan-line), the wider it makes the scan-line. Thanks! Well, What I think I did (as I discarded the actual file) was make the screenshot grayscale, added a new layer, filled it white, them made a mask with black and white rows. I think the scanlines layer has a bit of transparency too. Then I added text. Oh, and a vignette. Here's a couple of screenshots I though looked quite nice. 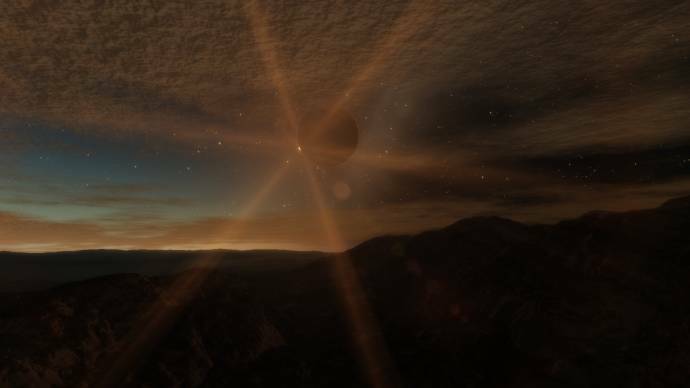 Space Engine is a really nice tool! Should join with Orbiter and both become open source for the ultimate universe simulation! Solar eclipse on terra moon in procedural galaxy 10 billions light years away from Earth. Im starting to post the system i found with a life bearing water planet and its 5 life bearing moons. Here is the world ocean planet with life.